Policy recommendations should be based on experiments conducted in the real world to have a deep and lasting impact, argues Professor Prakarsh Singh, citing results from his study on child malnutrition in the slums of Chandigarh. Much of modern development economics follows this principle underlying the physical sciences. An example is the experimentation conducted within the programme PROGRESA, which began in 1997 as a national programme in Mexico that was designed to address the problem of extreme poverty through a large-scale intervention. The Mexican government provided conditional cash transfers to parents amounting to 20-30% of their household income. The cash transfer was conditional on the child being enrolled in school and having regular school and clinic attendance. Parents received governmental money only if the child’s school and clinic attendance was above a designated minimal threshold. In the ﬁrst three years of the programme, the beneﬁts were extended to approximately 2.6 million families in 50,000 rural villages, which constituted about 40% of rural families and 10% of all families in Mexico. Villages were equally likely to be chosen as part of the treatment group, and on average, the villages receiving the treatment were very similar to the villages that were left untreated (the control group). This allowed for a comparison of the outcomes before and after the monetary intervention and for the experiment to produce conclusive evidence on the effectiveness of PROGRESA in improving children’s grades and health. A signiﬁcant improvement in the health of children was found in response to PROGRESA. This effect of the programme appeared to increase the longer the children stayed in the programme, suggesting that its beneﬁts were cumulative. However, there were many different elements interacting with one another in the programme. In order to deal with the massive increase in demand for schools and health services, the Mexican government began hiring more teachers, increased teacher wages and began training more medical personnel. The programme resembled a combined intervention in which many individual components came together to make it successful. However, we do not know which of these components was more effective than another. From a policy perspective, we remain unaware of the most cost-effective form of intervention, which may be making the cash transfers conditional on just school attendance or on trips to the clinic or whether the interventions are most effective when employed simultaneously. Modern development economics attempts to disentangle these different types of treatment effects in order to focus on the most cost-effective form of inter vention and improve public health policy. Close to 1.3 million children die ever y year in India due to malnutrition, according to the World Health Organisation. 99% of all under-ﬁve deaths occur in developing countries, with the most common causes of death being pneumonia, diarrhoea and malaria. These are illnesses to which children are particularly vulnerable, especially when they are malnourished, a condition that weakens their immune systems. Malnutrition contributes to more than a third of all child deaths.2 Worldwide, over 100 million children are under weight. While it is a serious problem in sub-Saharan Africa, even higher rates of stunting are found in South Asia, particularly in India. Along with Nepal and Bangladesh, India has the world’s highest rate of malnutrition. 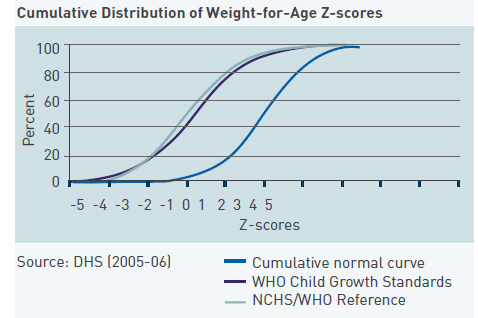 The graph below from the DHS (2005-06) shows us the normal distribution for weight-for-age z-scores. The blue cur ve on the right is the US cur ve. In the US, only a little more than 2% of children under the age of ﬁve years are undernourished in a normal population, with under weight being deﬁned as less than a -2 standard deviation from the mean. The area under the curve shows the percentage of malnourished children. In a normal population it is a small area, but in India it is an area about 20 times larger. One way to ﬁx the problem is to teach mothers about the right nutrition for their children or to give them money (as in PROGRESA). Distributing information is an important part of a solution, although it does not always lead to behavioural changes. Mothers are advised that when their child has diarrhoea they should increase their child’s ﬂuid intake and continue to feed them normally. According to the National Family Health Sur vey-3, nine out of 10 mothers do not follow this recommendation. In fact, four out of 10 mothers actually decrease their child’s ﬂuid intake. Medical solutions to the problem of malnutrition include deworming and nutritional supplements. Deworming campaigns are quite effective and have been conducted in many day care centres and health encampments. The treatment has been especially popular in Kenya and other parts of Africa, and now in India, the practice has become compulsory in all schools. Popularly used nutritional supplements include vitamin A, zinc, iron, and various minerals. In addition, iodised salt has been a popular weapon of the government of India as they continue to try and promote its consumption over normal salt. There is also a behavioural approach, which has very little to do with the advances in science and technology, but instead attempts to simply alter the behaviour of mothers and workers who interact with the child. This includes giving children the right type and amount of nutrition. We can focus on trying to change behaviour towards caloriﬁc food and encourage the consumption of a variety of foods. My research focuses on the slums that surround the city limits of Chandigarh, a union territory located in Northern India. About 50,000 people live in these slums. Less than 5% of the houses have working water ﬁlters. At the same time, however, 70% of the households own mobile phones. The people living in these slums are typically migrants from rural areas where wages are extremely low. The mothers in this treatment group are women who send their children to day care centres in the slums. India is home to the world’s largest child care programme, Integrated Child Development Ser vices (ICDS), which started in 1978. There are currently over one million of these day care centres (Anganwadis) run by the government across India. Each day care centre serves around 30 children on average. The children go to the centre ever y morning at 9 am and are fed their mid-day meals by day care workers. The meals are prepared by a good local agency that the government hires on contract. The workers are given training on child health and nutrition when they are hired by the government. Another aspect of the day care workers’ responsibilities is to visit and communicate with the mothers whose children attend the centre, giving them advice on how to keep their children healthy. The day care centres offer two potential channels through which they help children living in the slums. The ﬁrst is by the distribution of the mid-day meal and the second is by providing information and counsel to the mothers. However, a World Bank report on the ICDS ﬁnds leakages in the provision of meals and almost no effective communication between workers and mothers. The experiment tackles the question of whether it is the lack of information on nutrition given to mothers or the lack of child care worker motivation that makes child malnutrition persist. In the ﬁrst group, mothers receive recipe books written in Hindi. As around half of these mothers cannot read, the information is also distributed to other family members, including fathers, older sons and daughters. Government workers may also assist by reading and sharing information from the recipe book. The recipe book is designed with the help of a local nutritionist and contains 10 recipes, which provided an array of vitamins and minerals as well as sufﬁcient calories. 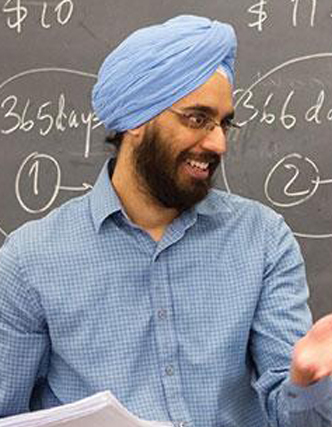 In the second treatment group, I provide incentives for child care workers to perform better. They are paid bonuses of Rs 100 for each child whose weight they successfully increase so that he or she is no longer classiﬁed as malnourished after three months. For each child under their care, the workers are given a goal card with the weight at which the child will no longer be considered malnourished. If a child at a normal weight becomes malnourished, however I subtract Rs 100 from the total. This motivates the worker to make the necessary household visits. To test how the two types of treatments interact, the informational and incentives treatments are combined in the third group. Complementarity may exist if incentivised workers are able to be more effective with nutritional information available to the mother. On the other hand, one of the two treatments may be sufﬁcient for improving weight. A separate set of centres form the control group where no intervention is assigned. Results show that malnutrition is reduced signiﬁcantly in three months for children in the combined treatment group by 4.2% but there are negligible effects in the individual treatment groups. The combined treatment effect persists for a year even after the incentives are removed after three months. One estimate suggests that the country gains Rs 20 for ever y rupee spent on the combined treatment in terms of increase in wages for these children due to an improvement in health and attendance. I believe that policy recommendations should be based on evidence from experiments and that increasing ﬁxed wages will not solve the problem. Similarly, offering performance pay is likely to be ineffective unless mothers have nutritional information available to them. Not only does this empower them, but it also facilitates communication between mothers and workers such that behavioural change can occur. Mothers receiving combined treatment begin feeding their children more protein and calories. A small push is required on the demand side as well as the supply side to target child malnutrition in India. Further experimentation in development economics can bring us closer to understanding how this serious problem can be ﬁxed efﬁciently and permanently. 1. Ludwig Wittgenstein who wrote on the subject of logical empiricism heavily inﬂuenced the Vienna Circle. 2. There are three types of indicators for malnutrition. The long-term indicator is stunting, which measures low height for age. The short- term indicator is wasting, which measures low weight for height. The third indicator is underweight, which measures low weight for age. This ﬁnal indicator captures both stunting and wasting. Bobonis, G.J., E. Miguel, and C.P. Sharma. 2004. “Iron Deﬁciency Anemia and School Participation.” Poverty Action Lab Paper No. 7. Census of India, 2001, Government of India. Web. September 1, 2010. http://www.censusindia.net/Deaton, A., J.
Dreze. 2008. “Nutrition in India: Facts and Interpretations.” Working Paper 1071, Princeton University. DHS India (2005-06). 2007. Final Report, International Institute for Population Sciences (IIPS) and Macro International Inc. Calverton, Maryland, US. Gertler, P.J. and S. Boyce. 2001. “An Experiment in Incentive- Based Welfare: The Impact of PROGRESA on Health in Mexico.” University of California at Berkeley mimeo. Statistical Abstract of Chandigarh. 2007. Chandigarh Administration, Government of India. Web. September 1, 2010. http://chandigarh.gov.in/knowchd_stat_ab07/. Singh, P. 2011. “Performance Pay and Information: Reducing Child Malnutrition in Urban Slums.” MPRA Working Paper 29403, University Library of Munich, Germany. WHO, Global Database on Child Growth and Malnutrition. 1999.